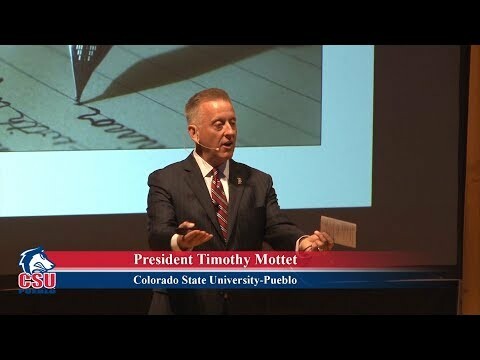 Colorado State University-Pueblo President Timothy Mottet shares his story, the story of the university, and the story we will continue to pen together. This compelling presentation was recorded live at Fall convocation on August 14, 2017. Colorado State University-Pueblo President Timothy Mottet and members of his cabinet continue to pen the story in Chapter two. This presentation was recorded live at Spring convocation on January 8, 2018. 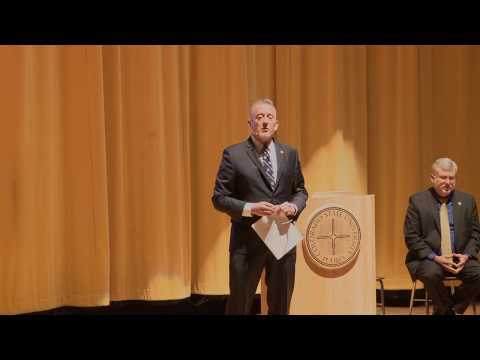 As provost at Northwest Missouri State University from 2014-2017, Mottet worked to keep higher education accessible and affordable by developing strategic partnerships and pathways with area high schools and community colleges. Mottet developed an academic vision around profession-based learning where faculty work with industry professionals to develop curriculum and learning opportunities that prepare students to be both professionals and engaged citizens who make significant contributions to their employers, communities, and families. Mottet served as dean of the College of Fine Arts and Communication at Texas State between 2011-2014. From 2007 to 2011, he chaired the Department of Communication at the University of Texas-Rio Grande Valley. Between 1998 and 2007, Mottet was a professor of Communication at Texas State. Dr. Mottet has co-authored four books and published more than 60 peer-reviewed journal articles and book chapters. His research examines the intersections of communication, personality, and cognition and their application to instructional, organizational, and interpersonal contexts. Most recently, he has researched the communication effectiveness of pediatric trauma team members in hospital emergency rooms. Mottet earned a Bachelor of Arts in Communication from William Jewell College, a Master of Science in Mass Communication from Boston University, and a Doctoral Degree in Instructional Communication from West Virginia University. He served as a 2016-2017 Baldrige Executive Fellow, associated with the U.S. Department of Commerce’s Performance Excellence Program, and was a 2010 participant in Harvard University’s Management Development Program for higher education leaders. He and his colleagues received the 2015 International Education Award from the American Association of State Colleges and Universities and Kansas City’s 2016 Northland Regional Chamber of Commerce Award for Excellence in Higher Education. Tim and his spouse, Rick Gonzalez, enjoy entertaining friends, spending time with their families, exploring the French Quarter in New Orleans, volunteering at animal shelters, collecting art, and scuba diving.